All of us here at Queen City Drinks were lucky enough to get invites to the soft opening of the newest place on the banks, The Yard House. 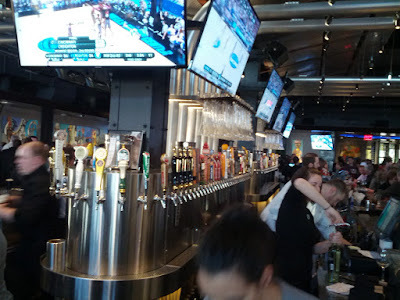 The Yard House is an interesting place with an amazing beer selection on 160 taps! Due to the overall craziness at the entrance I started with a Fat Heads Head Hunter IPA after actually getting a chance to review the full list I moved to their special house beer, a Belgian Amber Tripel. The Yard House Belgian Amber Tripel clocks in at 9% abv and is a complex brew. It’s much more of an amber then a tripel as the sweet caramel flavors from the amber overwhelm the fruity Belgian action. It’s definitely worth a try but pales in comparison to the rest of their beer menu. Not to say this is a bad beer, just that they have SO MANY amazing brews. A nitro tap is a beautiful thing! 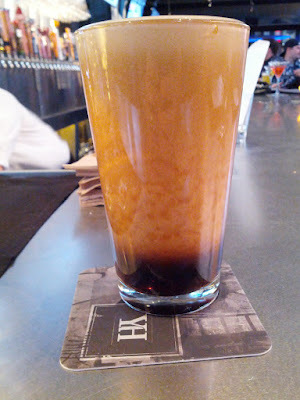 I finished off my time there with what is quickly becoming one of my favorite beers, Rivertown’s Roebling porter on a nitro tap. This is only the second place I’ve seen this, the first being Rivertown’s tap room. Out of the bottle Roebling is so-so but on a nitro tap it is absolutely astounding. Food wise they had people roving around with trays of appetizers and small bites. The joint was so packed it was hard to get around to try the different tastes and then I ended up hanging out at the bar while most of the trays moved around the edges of the tables. I did end up being able to try 2 or 3 things including some rocking pasta with chicken and some kind of Asian beef and rice. Speaking of food brings me to the fact that the Yard House doesn’t seem like a restaurant. This is mostly due to the way it’s laid out, big central bar surrounded by a ring of 4-person high tops with 6 person booths lining the edges. There is also a massive patio with a mix of 4 and 6 person tables. The size and focus of the bar really makes it seem that that is what this is, an amazing bar. Sure it’s got food, most bars do, and that food is likely amazing. But the first part of the menu is all beer. Now don’t misunderstand me, this is not a bad thing at all. And time may show that my observation is completely wrong. Building wise it’s a really nice place. An amazing view of the river, the Roebling bridge, and Paul Brown stadium. So 2 walls are all glass, 1 wall is the entrance, the last wall… yeah it’s a massive room full of kegs! On the inside they’ve got some great automatic blinds that they seemed to be playing with randomly last night. It’d go from slightly dark to mid-day brightness as soon as they opened the blinds. There is a ring of TVs above the bar showing sports. One note on local beer, the Yard House has quite a few local brews but noticeably absent is anything from Blank Slate, MadTree, 50 West, Cellar Dweller or Listermans/Triple Digit. However Rivertown, Mt. Carmel, and Moerlein are well represented. Now the reason for this, I’ve been told, is that the Yard House nailed down the tap list something like 6 months ago. MadTree didn’t exist and Blank Slate was still self-distributing back then. So give them some time and I’m confident their tap handles will make an appearance. There is another soft opening night tonight and the general public can get in after 8 pm. Then it opens for real tomorrow afternoon. I would suggest giving them a few weeks before going though. Let all the kinks get hammered out and give the massive crowds time to die down. But definitely make a point to get there soon it is an awesome, very welcomed, addition to the banks! Now keep an eye out for the thoughts from other members of Queen City Drinks!